Guardians of the Galaxy is another entry in Marvel Studios’ continuously expanding cinematic universe. Chris Pratt portrays Peter Quill, a human who leads a group of extraterrestrial misfits on a journey to save the galaxy. Unlike the intensity of many other superhero films, Guardians of the Galaxy is a much more fun, comical and tongue-in-cheek. The film presents the formation of a bunch of unlikely heroes. Compared to Marvel’s other films, Guardians of the Galaxy doesn’t take itself seriously at all, if the film’s talking raccoon Rocket, voiced by Bradley Cooper, is anything to go by. The film positions itself as big-budget family entertainment, with colourful settings, witty humour and a narrative and tone that requires very little investment. Almost the entire film is set in outer space and on alien planets. The only glimpse we get of Earth is in the early moments of the film, as we are introduced to a young Peter Quill. 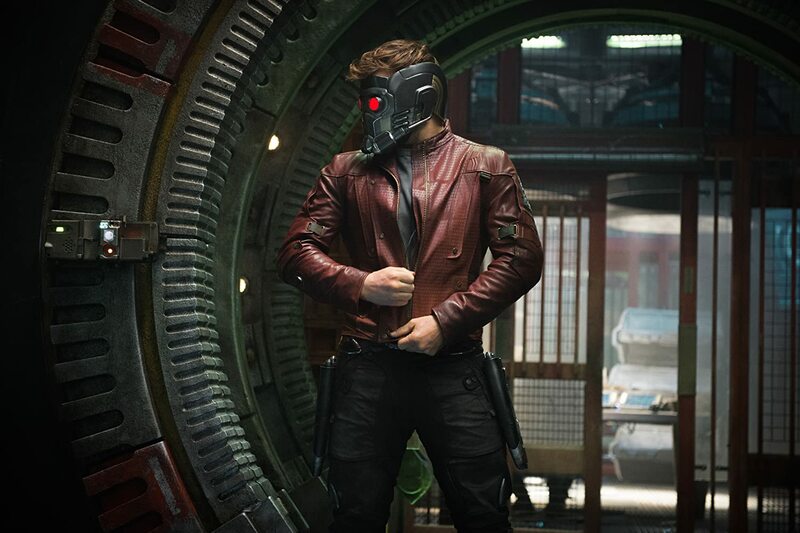 The film fast forwards a number of years and we see the emergence of an adult Peter, now a galactic outlaw using the name Star-Lord. The film’s plot concerns a mysterious orb, which Peter discovers and this sets in motion an action-packed adventure, featuring various extraterrestrial beings, who want to obtain the orb for themselves. This includes the film’s main villain Ronan (Lee Pace) and Yonda Udonta (Michael Rooker), the leader of a group of bandits. After a series of events, Peter finds himself in captivity and bundled together with four other captives, who soon become his allies. He teams-up with talking raccoon Rocket; a humanoid tree-like creature called Groot (Vin Diesel); Drax (Dave Bautista), a dim-witted warrior with scarring all over his body; and the only female in the group, Gamora (Zoe Saldana), a green-skinned trained assassin. The central characters are about as contrasting as you can get, and they all struggle through various brawls, galactic battles and explosive space scenes. The group are essentially a bunch of amateurs. The team often make do with whatever they have at their disposal. Quill might be the leader but he is no systematic planner, often making irrational decisions. The group are erratic and disorganised, but this is all part of the fun. It is a divergence from the typical co-ordination and understanding of superhero team-ups. The film prospers with its sense of humour, as it is all very ironic and self-aware, but not enough to be a parody. The film is filled with sarcastic and silly jokes that you just can’t help laughing at. Although the heroes of the film are great to watch, the villains lack substance. Ronan is pretty contrived and he serves a much bigger force. The orb in the film is the plot device that gets everything moving and without it, I do wonder how the film holds together. However, I genuinely enjoyed the overall tone and setting of the film. It is refreshing to see a superhero film set in outer space, as opposed to the familiar urban settings. Guardians of the Galaxy is all light-hearted stuff that doesn’t have substantial resonance in the long-run, but it’s easy to watch. It’s an ideal Saturday night movie. It’s also marks the first entry in a planned series of films. Guardians of the Galaxy does finds itself in a strange position, as it is not among the best in its genre, but nowhere near the worst either. Overall, it does a good job of expanding on the Marvel Cinematic Universe. I would only recommend Guardians of the Galaxy to fans of Marvel, as it will be of little relevance otherwise. The film simply doesn’t have enough weight to be appreciated by non-Marvel fans, but if you’re seeking lots of thrills and action, then Guardians of the Galaxy is definitely worth a watch. Stars: Chris Pratt, Zoe Saldana, Bradley Cooper. Such an awesome film, had me laughing all the way through. Great soundtrack too. Can’t wait for the second juan. Yeah, the soundtrack was great. The next one should be good too! Guardians rocks! Inevitably, paths will cross with the rest of the MCU in the Infinity War. Yep, I’m looking forward to Infinity War. It’ll be interesting to see how they juggle an even bigger cast. Absolutely, the Russo brothers are good jugglers, thankfully. I absolutely love this movie. Will never grow old. Love everything about this movie. My favorite Marvel movie to date. I did really enjoy it but you definitely liked it more than me. I think my favourite would have to be Civil War. Loved everything about it. Civil War is very close to being my favorite, but Guardians tops it. Still, both are good movies.